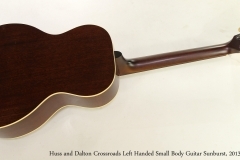 Here’s an unusual Huss and Dalton Crossroads Left Handed model! This wonderful guitar was built during 2013 at the Huss and Dalton shop in Staunton, Virginia. The Huss and Dalton Crossroads line begins with the DS Crossroads – Dreadnought Slope – and draws from the venerable J-45 design with Sitka Spruce top and Mahogany back and sides. The Crossroads model itself is based on traditional small or ‘L’ bodied Gibson guitars from the 1930’s and later. Those guitars were used by many thousands of players before the now-ubiquitous D style Dreadnought body came to prominence. 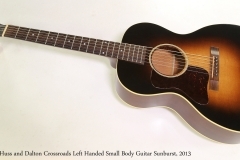 “We think of the Crossroads guitar as a smaller DS Crossroads. The tonal balance is similar, and its volume doesn’t suffer much from being caged in a smaller body. You may find that the Crossroads makes a more convenient traveling companion than its DS Crossroads big brother. This example is in very clean condition, with just a few small marks here and there and the slightest wear. Huss and Dalton have mastered the art of lacquer finishing, and the build quality and attention to detail are very high. The original tweed hard shell case is included.